NYT Vs. Tesla Motors. 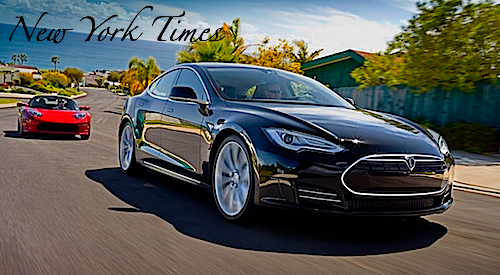 None have caught the eye of the public then the last few weeks of disdainful mainstream general news, epitomized by John Broder for the New York Times on his Tesla Model S rant, which not only discredits him but was harming the NYT’s image. The infamous John Broder’s February 18 New York Times piece showed how little proper understanding Broder had, as many mainstream media reporters show at events. These people are not always the best candidates to drive these cars and give their opinion public, albeit usually an erroneous one. The Venerable gray Lady acknowledges "problems with precision and judgment" in an earlier piece that faulted Tesla's new electric car charging infrastructure. Many will see this as yet another sign of how professionally dilapidated the news media has become and after all, can you blame them when only three companies owns all the news here? Certainly not and this New York Times going back over its previous judgement gives the electric car validity as a daily, reliable, efficient means to travel. Well, one thing can't be argued, at least not seriously by anyone with any sense of design, the Model 'S' is the most beautiful 4-dr sedan currently in production, on the planet. It is also interesting how much vitriol electric cars generate with some people. Reminds me of how much some drivers hate bicyclists. Makes you wonder about how their brain is wired.